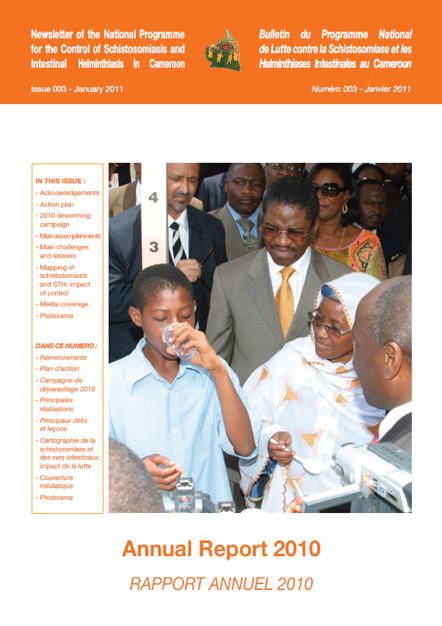 This report highlights the achievements and challenges experienced during the 2010 National Deworming Campaign which was launched in May by the Minister of Public Health and Minister of Basic Education at Government Primary School, Nkolbisson, Yaounde. The campaign was implemented by the National Programme for the Control of Schistosomiasis and STH under the leadership of the Ministry of Public Health and in collaboration with the Ministry of Basic Education, Union of United Cities and Councils of Cameroon and other partners. The deworming of 5,941,235 children including 3,237,306 school children dewormed in schools and 2,703,929 children dewormed in the communities during the Mother and Child Health and Nutrition Action Week. increased awareness and leveraged partnership for the control of schistosomiasis and STH in Cameroon. 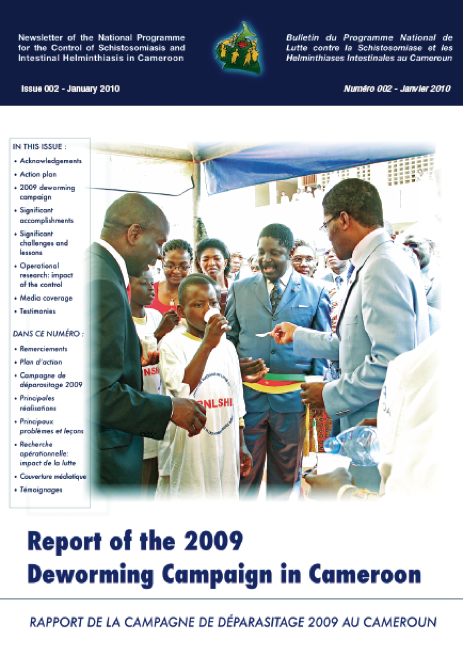 This report highlights the achievements and challenges experienced during the 2009 National Deworming Campaign which was launched in May by the Minister of Public Health and Minister of Basic Education. The campaign was carried out successfully through efforts made by all partners both government and non-governmental. Special emphasis to the Global Network for Neglected Tropical Diseases (Global Network) for its financial support, Johnson & Johnson/Children Without Worms for donating mebendazole and to Merck/WHO for donating praziquantel. The deworming of 5,957,122 million children including 3,029,714 school children dewormed in schools and 2,927,408 children dewormed in the communities during the Mother and Child Health and Nutrition Action Week. 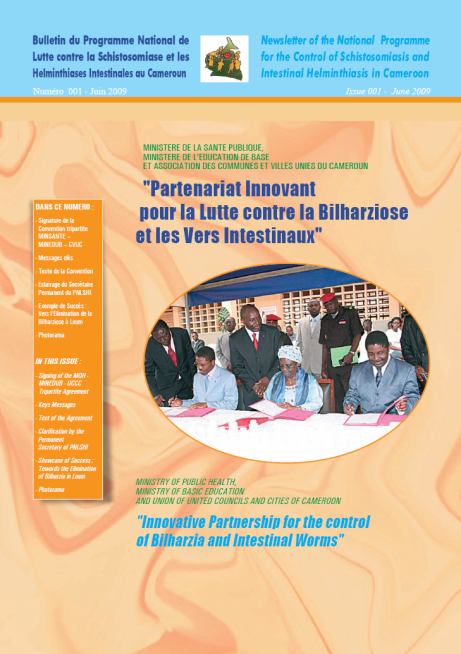 There is a strong commitment by the government in combatting schistosomiasis and intestinal worms in Cameroon. These efforts were highlighted during the partnership signed between the Ministry of Public Health, Ministry of Basic Education and the Union of United Cities and Councils of Cameroon. The permanent secretary for the programme Prof Tchuem Tchuente stated that this partnership was 'the culmination of long process of discussions and negotiations between the three parties and this agreement is a defining moment in the control of schistosomiasis and intestinal worms in Cameroon'. This newsletter highlights the content of the agreement/commitment made by each party.